The Altimaster Galaxy was developed from the Classic Altimaster III but with significant improvements. The most obvious upgrade is the user replaceable lens and significantly larger numbers on the faceplate. The Galaxy has an altitude range of 18,000 feet marked in 250 foot increments meeting the needs of most skydivers. It contains a durable and precision mechanism and comes complete with hand mount. A wrist mount is also available. Available in feet or meter faceplate. A Glow Face model is also available for night jumps. Available in a wide variety of colors. Bought mine on (gasp!) ebay for $80.00. Crap shoot--but what the hell. It works fine. It came with a different mounting strap--not the finger kind but around my wrist and thumb. I like it. Funny thing--went aboard a commercial flight and brought it with me (set to zero in the boarding area). About an hour into the flight I checked it to see what the altitude in the cabin was. Was pretty surprised to see 13,000 ft. Made cabin crew aware that this altitude was higher than it should be. First officer came back--looked at it and said, "make it a habit of carrying an altimeter do ya?" He returned to the cockpit and I watched the altitude in the cabin decrease slowly to about 7000 ft which is pretty normal. Later I found out that they do this deliberately--especially on red eye flights. Passengers pass out from low air pressure and the cabin crew doesn't have to work so hard. I carry it with me every time I fly now. I like this altimeter. Its got easy to read numbers, its set up with 12k ft on the 12o clock position. It could be confusing that both 12k and 0k is the same place. This has never confused me, but I imagine that if I ever find myself confused, then I could just look out the window of the airplane. So its not a big deal. The concept of having 12k ft and 0 ft on the same position is also known from watches. This makes it very quick to read since I dont actually have to read the numbers, I could just make a quick glance at the angle of the needle, and I know from my many years of experience with normal watches what the number would be at that angle if I would have read it. Saves me about 0.12 seconds every time I take a peak at the altimeter. The needle moves past a yellow area when its time to concider your altitude, and a red area when you absolutely should start concidering it. I dont honestly dont know how usage of the altimeter could get any easier. The dial on mine became bent, and it became impossible to adjust it. I dont know how this happened, but I am suspecting heat damages, so I was preparing all kinds of defensive arguments about the sun and the summer and the time of year a typical skydiving season occur, so it I am just using it normally. Just in case they would comment on this or accuse me of negligence. But this never happened. Au contraire. All emails was answered friendly and professional within a few hours. They sent me update emails when they had received and sent it, they used very short time to repair it, and they even sent it back to me free of charge. You put it on with a velcro around your wrist and two fingers through a rubber ring. Not everyone has the same finger circumference, and sometimes I use gloves. Yet I dont see any adjustment opportunities on this rubber ring. So its a bit too loose or too tight depending on how fat I am each day. I also thought it was a bit heavy. But at the same time I realize its made from sturdy material. So I guess its a balance. Still I cant help noticing that my quad core smart phone with barometer, screen and GPS weighs less than this altimeter. I would like to give this altimeter a thumbs up but there have been numerous defects this season with this equipment. I purchased a brand new one and after five jumps the dial broke at 13.5k . Luckily some one had a spare altimeter for me to borrow so I didn't have to ride back down. Needs to be reset first thing in the morning. My Galaxy altimeter has served me well. It is a simple, well-made product that always works. I have never had any concerns regarding my altitude on a skydive. I recently had the opportunity to have my Galaxy serviced. I sent it in for service and got it back within 2 weeks!!! Alti-2's return process and customer support are top notch. I received E-mails throughout the process and was notified when it was ready. They even replaced my lens cover for me!! You cannot beat a great product that has superior customer service to boot!! didn't like mine, stuck too much on acsent. Turned it in after I recieved it it back it stuck worse. Alti 2 is sending a new one, great costomer service though! After doing a jump with a borrowed altimeter where the needle stuck at 8 on the plane ride up, I knew it was time to invest in my own. I opted for this one and have been extremely pleased. Unlike the older models, this one doesn't wobble on your wrist at all during freefall; it stays flush on the wrist and is easy to read. Movement of the needle has always been smooth for me--no sticking at all. I wear mine so that the dial itself sits not precisely on the back of my wrist but more on the pocket between my thumb & forefinger. The strap's design keeps it in place and makes viewing it very easy during every skydive, regardless of the type of jump I'm doing. Calibrating is easy with the large knob. I highly recommend this item. Only problem I've had was the OEM strap came unsewn, a few minutes at a sewing machine fixed that. Other than that a great, reliable altimeter that has given me zero problems. Rugged, reliable, quality construction. I love it, and Alti-2 has a place on their website that allows you to custom design your face plate for FREE with $10.00 shipping and handling to thank their customers. Cooool. I just bought a used Galaxy and I love it. The numbers are small, but very easy to read with the hand mount. It's a little heavier than some altimeters, but I actually like that. I take it to mean a stronger product. I usually compare my altimeters to the aircraft's I'm riding in and the Galaxy is always very accurate. You can also get a custom face from Alti for free. Just send them the altimeter and your design. I would recommend it to anyone. Bought my alti a week before I started AFF (obviously wanted to get into the sport for the long run!) and it has put up with quite a bit from a newbie. It fell out of a Protec helmet on a shelf 6 feet off the cement floor (OUCH!) this past weekend. And guess what? Not even a scratch! Tested and jumped it an hour later. Wonderful fit and finish from an outstanding manufacturer. Also, the wrist strap part wraps perfectly around my gloves' velcro for a little added security. Get one today, worth every penny! Recently got an Alti-III Galaxy, and it feels pleasantly different from other altimeters I have jumped. Feels very reliable; the needle's movement is creeping rather than jerking (as compared to an old Barigo and a new FT-50). The case is anodized aluminum, which is a big plus - it's not easily scratched. If you do buy one, opt for a custom faceplate -- it's free and neat (but does not come in metric units - I think - and no glow in the dark thing). Alti-2 may recommend making the faceplate's decorations semi-transparent. This is probably a good idea for light background / dark image, but a dark background / light image better stay opaque, I think. I wish Alti-2 would start a gallery of custom faceplates to choose from, or at the very least made a layered PSD template, so you could fiddle with decorations better. It's heavier than Barigo/FT-50, but not tiresomely so; the weight actually seems to reassure that this is one tough altimeter. Finally, the communication with Alti-2 has been nothing short of pleasant. 10 year warranty so you might quit before it does, big easy to read numbers on your altimeter or the guy beside you, accurate, different mounting options, make Alti III Galaxy is a very good altimeter. The only thing I don't like is that the lens is convex, which seems to make it easier to scratch. 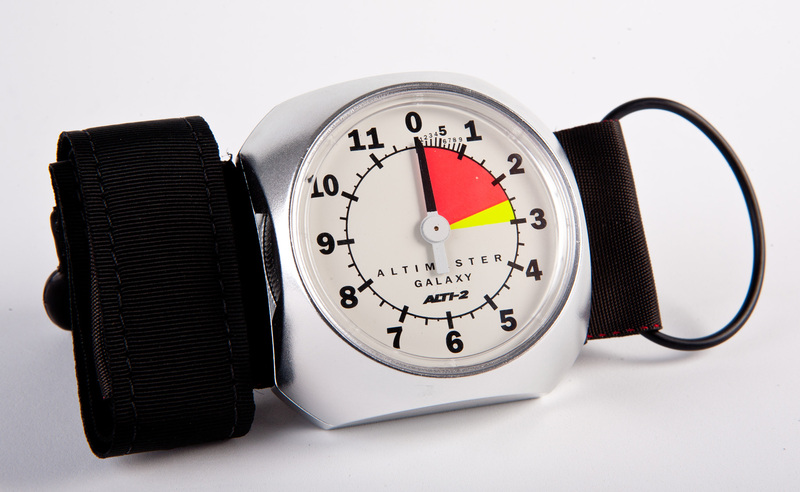 Excellent quality altimeter with a sturdy hand-mount. Comes with a 10 year warranty. Easy to read with large numbers. For a few bucks more you can buy one with a phosphorescent face that provides a background glow to assist in low light conditions. The glow lasts over 2 hours in complete darkness which makes it perfect for night jumps. I highly recommend this altimeter. Can't choose your mounting option when ordering. I've had my Galaxy for about six months and for over a hundred jumps. I replaced the wriststrap/finger loop mount that comes standard with a regular wrist strap, which is more secure for me in freefall. I chose this altimeter primarily because the lens is field-replaceable. I ordered a spare lens with mine in case I broke the original, which fortunately hasn't happened. It's been to 12,500' and reads accurate against the plane altimeter. It's very compact but easy to read. I used an Alti-III as a student, and now I recently picked up a silver Alti-III galaxy. The first thing you'll notice is the bigger numbers on the wider dial looking back at you. I like the new look, Even easier to read than the already good alti-III, and still has the same familar caution/warning arc. While it's nice that they decided to make the lens user-replacable, the lens is no longer recessed below the lip on the metal housing. Seems to me this would make it easier to scratch up the face while manuvering around inside the plane. The replaceable lens is a great idea. An excellent product.